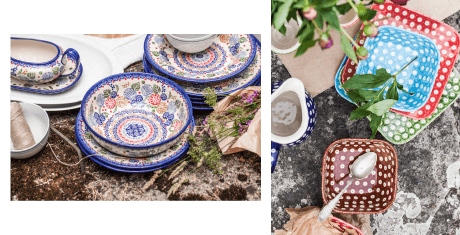 Bolesławiec pottery can be found on the tables of the lovers of manually manufactured vessels all over the world. The traditional technology, unique forms, and, most of all, exceptional design patterns have made our products extremely popular for many years. Manufactory – a gallery of unique stoneware vessel. Since the time it was invented, pottery has constantly accompanied man. Practically unchanged with respect to the technology, it reflects ourselves by means of its form – our tradition and our times, our inspirations and the passion for beautiful forms of applied arts. Manufactured manually, decorated with unique, original patterns, it becomes Art thanks to the elements: earth, water, wind, fire, and the fifth element – man’s aspiration to be surrounded by beauty. This website was created to demonstrate how the fifth element completes the form. How it creates unique ceramic forms.